Today feels like the first day of school – there’s a little nervousness (that I’ve dotted all the i’s and crossed all the t’s) along with the anticipation of making new friends and the comfort of connecting with old ones. You see, this is my first time participating in the Secret Recipe Club – each month, I am assigned a recipe blog to scour and make any recipe I like. Then on Reveal Day, I share the blog I was assigned to and which recipes on that blog I made. My assigned blogger was Kate from Kate’s Kitchen and man, this gal sure does cook – as well as entertain. I kept reading blog post after blog post of all the wonderful dinner parties she hosted – you definitely luck out if you are her neighbor, co-worker or a part of her family! Anyway, I really liked how Kate takes on all types of cuisines with gusto. As a result, I had trouble narrowing down what I wanted to make. I finally settled on her recipe for Cumin Flatbread, which I tweaked by using chickpea flour (a riff off of another one of her posts on a flatbread dough made from hummus.) I also cut back on the salt, added some smoked paprika to the dough (my obsession continues!) and topped the rolled out dough with sesame seeds, poppy seeds and cracked black pepper. 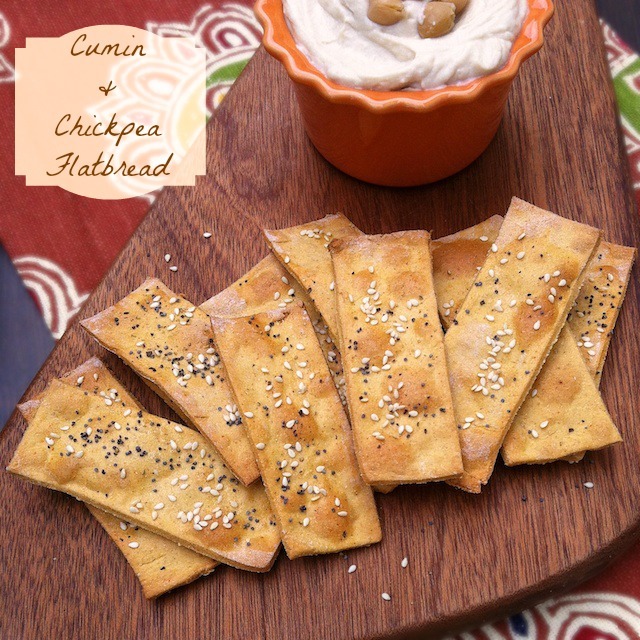 Made with chickpea flour and seasoned with cumin, this flatbread is delicious when served with hummus, baba ghanoush or just on its own. In a large mixing bowl or a stand mixer bowl, sift together flours, sugar, cumin, smoked paprika and salt. Stir in water, 1 egg white and oil. Mix until a dough forms. On a floured surface or in a stand mixer, knead dough for about 5 minutes. Form into 4 balls. Reflour the surface and roll out each piece of dough until paper thin. Slice lengthwise into 1 1/2-inch wide x 4-inch long strips. Place on baking sheets. Brush flatbread with remaining egg white. 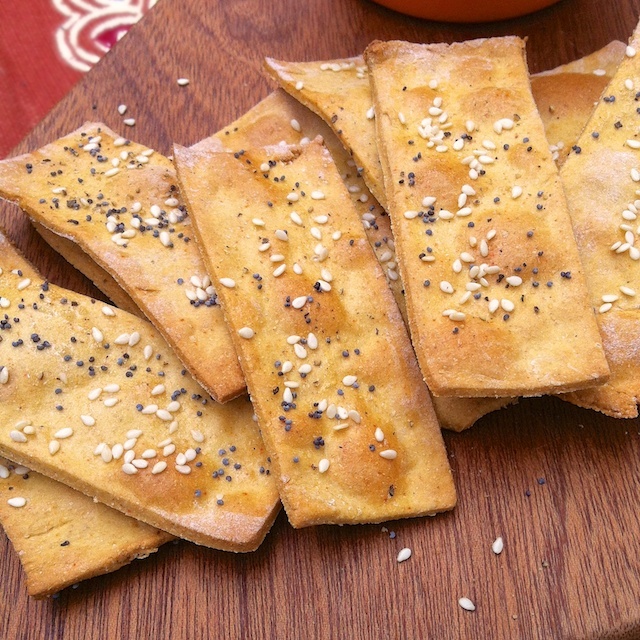 Sprinkle sesame seeds and poppy seeds over flatbread. Top with freshly cracked black pepper. Bake for 13 – 15 minutes or until golden brown. Cool on racks. These were delicious (and pretty too!) I served with them with hummus for a double dose of chickpeas (from the flour in the flatbread dough and chickpeas in the hummus.) And here’s a nutrition nugget: Chickpeas – also know as garbanzo beans – are a great source of fiber, protein and are low in fat. Next time, I want to serve these with the baba ganoush (eggplant dip) that Kate also blogged about in her cumin flatbread post. So many recipes, too little time. Thanks for the recipe inspiration this month, Kate! OH, I like this. I’ll bet I could use GF flour instead of whole wheat and make these gluten free. They sound awesome. Great choice! Yes, Debbi – I thought about that after I made this- that you could easily swap in GF flour or possibly use only chickpea flour for the entire recipe to make them GF. I definitely be baking with chickpea flour again – so tasty. I cannot to dip these in some hummus! Love it! Thanks Melissa – excited to be on board! Loved reading about your Rocky Road Oatmeal – yum. Yes, you either love or hate that spice. 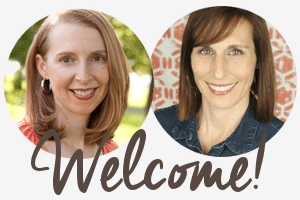 So fun to get to know you through you blog, Kate! Oh my gosh, I would not be able to stop eating these. I don’t think I would even share! Baba ganoush would be perfect with these. The look wonderful. Those looks totally wonderful, now to go and round up some chickpea flour. And will try to make them GF as so many people I know are going GF. Sid – I’d be curious to make them again using all chickpea flour since it’s gluten-free – let me know if you do! Just dropping by from group B. These look delicious! Marilyn recently posted..The Birthday Party Begins! 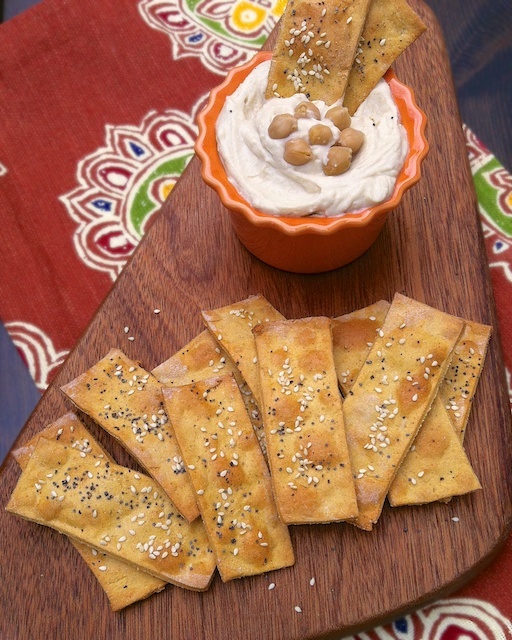 This sounds amazing… Love to make my own flatbread.. Pinning it so I can try. Found you over at 4 You With Love Spice Party. Marlys – thanks for stopping by! Do let me know if you make it – it was really easy and very tasty – enjoy! Marilyn recently posted..My Favorite Spices #GiveawayWinner, Plus Four $10 Gift Card Winners, AND 10%Off #CouponCode for EVERYONE!